Wander down to Westlake Park in downtown Seattle and happen upon Steinunn Thórarinsdóttir’s 26 life–size, androgynous human sculptures. Thórarinsdóttir’s installation Borders will extend throughout the park between Pine and Pike streets June 6 to fall of this year. The figures, 13 aluminum and 13 cast iron, some standing, some seated on park benches, will mirror each other in silent conversation and form unseen “borders.” As visitors pass by or investigate the sculptures, they will cross the borders and, for a moment, serve as “ambassadors” between sculptures. The exhibition addresses humanity and diversity, appropriate for one of the most culturally and politically active sites in Seattle. Meet Thórarinsdóttir at the artwork’s opening, 5 p.m., June 6, at Westlake Park. Ambassador of Iceland to the United States Gudmundur Árni Stefánsson, Seattle’s Deputy Mayor Darryl Smith and Seattle City Councilmember Tom Rasmussen will also be present. The festivities will continue at the Nordic Heritage Museum with a reception from 6 to 8 p.m.
Thórarinsdóttir has worked as a professional artist for more than 30 years and exhibited widely in Europe, Japan, the United States and Australia. Her works are in private, public and corporate collections around the world. She has completed commissions at Leifur Eiríksson International Airport, Iceland; and the two-part memorial Voyage in Hull, England, and Vik, Iceland, among others. Thórarinsdóttir recently finished a 30-foot-high sculpture for the University of Aberdeen in Scotland. Borders comes to Westlake Park as part of the joint efforts of the Seattle Office of Arts & Cultural Affairs and Seattle Parks and Recreation to mix art into daily Seattle life and to enliven our downtown public parks. Partners also include The Roosevelt Hotel, Seattle; Scott White Contemporary, La Jolla, Calif.; the Consul General of Iceland in New York City; the Icelandic Embassy in Washington, D.C.; Iceland Naturally; Seattle Sister City Reykjavik; Icelandair; and Eimskip Shipping Firm. 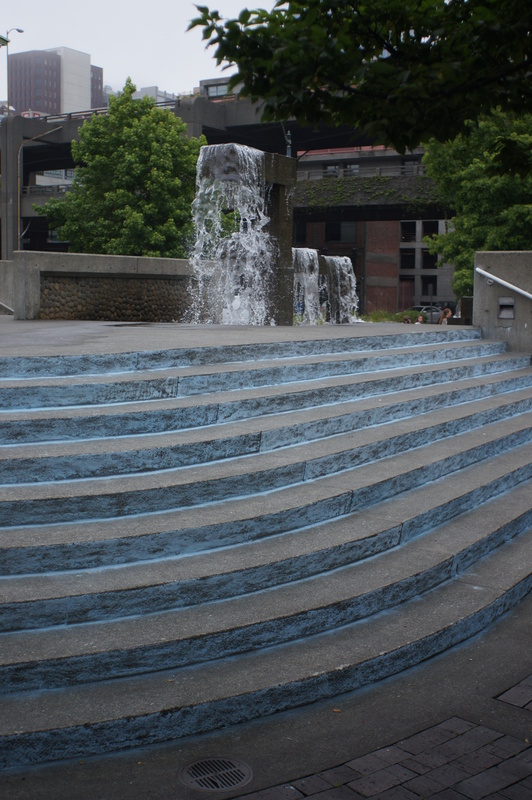 Image: Steinunn Thórarinsdóttir, Borders, located at Westlake Park. Seattle Center is seeking proposals for “fun, imaginative and family-friendly” activities to enliven space once occupied by amusement rides. Next month, Fun Forest Amusements (FFA), Inc. – which has operated at Seattle Center for 47 years – will consolidate its amusement rides in an area south of the Monorail station, freeing up 68,000 square feet of outdoor space. Selected proposals will be for temporary attractions and events between May 2010 and December 2011. In January 2012, Seattle Center will start preparing its facilities and grounds for a six-month celebration of the 50th anniversary of the 1962 Seattle World’s Fair. The deadline to submit proposals is Monday, Jan. 18, 2010. Download the Request for Proposals. Image: Ferris wheel at night during Winterfest 2002. Photo by Erik Stuhaug.